Yesterday, inspired by the Sailabration of the War of 1812, I did a bit of alternative history, wondering what would have happened to the United States if it had won the War of 1812 and conquered Canada. I may have understated the case. One of the great fears of the founding fathers was that the United States would collapse into a bunch of squabbling states. Absorbing Canada might have made this outcome far more likely. But as a follow-up I want to reverse the question, what if Canada had lost the War of 1812? Living next to you is in some ways like sleeping with an elephant: No matter how friendly and even-tempered the beast, one is affected by every twitch and grunt. But imagine if the United States had decisively defeated Canada and perhaps taken some strategic Canadian territory (say Halifax). Canada could easily have become paranoid and obsessed with its southern neighbor. Imagine a Canada devoted to a Pyrrhic arms race with the United States. It is easy to imagine this paranoid and disadvantaged state seeking asymmetric means against its more powerful neighbor. This hypothetical vicious Canada might reach out to hostile Native Americans, secessionist southerners, and attempted to build alliances with Mexico and European powers with a presence on the American periphery. Meanwhile, Canada itself would be impoverished. The social programs Canadians cite with pride would not be possible with enormous defense outlays. Perhaps there would be Canadian politicians who recognized the folly of this policy, but large bureaucracies have a knack for justifying their existence. The military would become a state within a state, untouchable by other authorities. I bring this up to illustrate the importance of national honor and the national narrative in shaping national policies. Realists of various stripes may argue that it is all about geopolitics and pursuit of power on the international stage – and certainly those things are important. But so is a nation’s sense of itself. In the case of Pakistan, a country with which I am obsessed, this has been crucial. Many Pakistanis recognize the conflict with India is futile and drainingthe nation’s wealth so that it falls behind India on a per capita basis (on top of the massive difference in size.) But the overfed military dominates the nations politics and devours its resources. The military has fostered an Islamist narrative of Pakistan’s history to cover both the country’s development failures and its enormous ethnic and sectarian splits – while insisting India (and now the US) is behind every mishap. If Pakistan felt it had defeated India, perhaps it would be in a stronger position to make peace and perhaps redefine its conflict with India in terms of culture and economics. The validity of Pakistani grievances may have some merit, but the means with which they have sought to rectify them do not. But their national narrative is that the world is against them and thus any means needed to survive can be justified. Tim Pawlenty is, by all accounts, a capable politician and nice guy. He might help Romney electorally, although the impact of the vice presidential selection is usually over-estimated. But Romney needs to seriously consider who will be his partner in governance and for all his virtues, Pawlenty does not have any Washington or national security experience. Since Romney himself also doesn't have experience in these areas this is a factor to be considered. The White House is a unique environment and under a far more intense public microscope then any governor's mansion. A President Romney will want an experienced governing partner who can provide high-level advice. Since 1977, vice presidents have been Senators or experienced DC-hands. The last governors who served as vice presidents were Nelson Rockefeller (for Ford) and Spiro Agnew (for Nixon). The last (and only) time a vice president with no DC experience played a significant policy role as a presidential advisor was Garret Hobart as McKinley's vice president from 1897 to 1900. I remember a DC-insider telling me that Gore and Clinton were like peas in a pod, and on the surface at least the same would seem to apply to Romney-Pawlenty. I have no information about their personal dynamics - which is critical - but as an experienced politician Pawlenty probably knows how to play nice with the other kids. In the past 40 years, Senators have been the VP and getting along is a key skill. Governors have been less able to adapt to the second-fiddle role of the VP. But Pawlenty's career and behavior show little indication that he would be a loose cannon. Just to reiterate, I have no problem whatsoever with Pawlenty, who seems like a responsible and realistic politician. But Romney needs someone who can tell him about things with which he is unfamiliar - like the Senate. This highlights Garret Hobart, who as McKinley's vice president played an important role. Hobart had no national political experience, but he had been speaker of New Jersey's House and president of New Jersey's Senate. He ingratiated himself to the US Senate and was generally praised for handling the Senate smoothly. However, the gulf between the Senate of 1896 and the Senate of 2012 is vast. Hobart's experience at the state level probably translated well to Washington. But no longer, state legislatures are very different animals - for example each US Senator has a 50+ person staff, his or her own tiny bureaucracy. Plus there are the well-staffed committees and agencies attached to Congress (like CBO, CRS, GAO etc.) Also, foreign and military affairs are not areas where Romney is knowledgeable and Pawlenty will have little advice to share. Minnesota does not have a CIA equivalent (as far as anyone knows) and he has not had to manage relationships with enemies and allies. Returning to Clinton and Gore who enjoyed an excellent relationship, Gore was a Senator and well-regarded on arms control and other national security issues. By all accounts the two men hit it off - but also, when push came to shove Gore had unique areas of expertise he could bring to the table. Dystopia: What if the US conquered Canada in 1812? 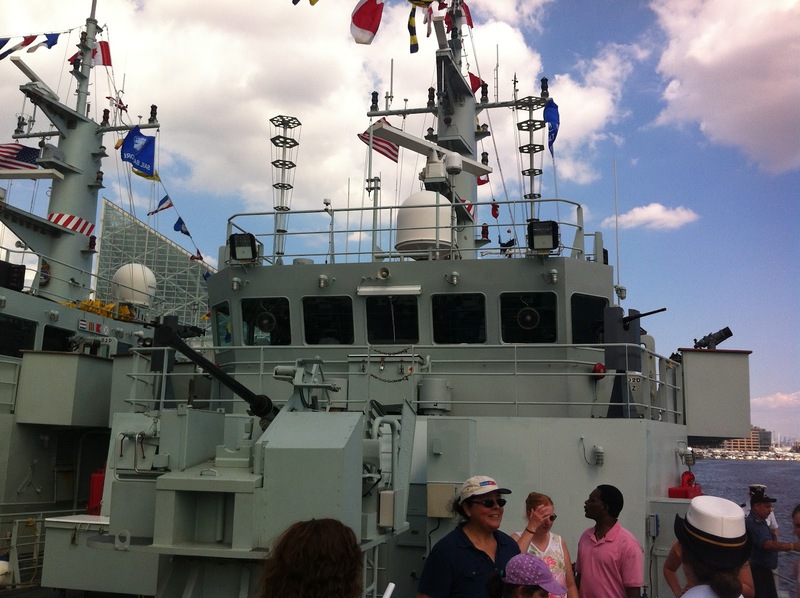 At the Sailabration, ships from around the world visited Baltimore in commemoration of the War of 1812. 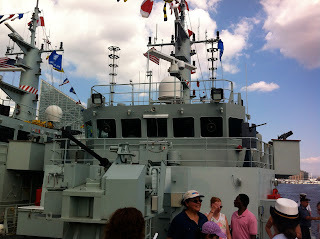 I love ships and was like a kid in a candy store. From the majestic sailing ships to the small working vessels I wanted to visit each and every one of them. But my favorites were a pair of Canadian warships, the HMCS Moncton and its sister ship the HMCS Goose Bay. They were originally designed as minesweepers so they have shallow drafts and could make it into the Inner Harbor. The big modern warships were confined to the deeper waters at Locust Point. I toured the Moncton. It doesn't carry missiles, but has a 40mm Bofors gun and a pair of 50 caliber machine guns. It serves in a variety of capacities including sovereignty patrol (driving around the Arctic - not lightweight work) and drug interdiction. The officer giving the tour pointed out the assault rifles secured by the bridge. They are similar to the M-16, except that the trigger guard is removed so it can be fired while wearing mittens and it is specially manufactured to work in all-weather conditions as the ship could be deployed in the Arctic Ocean or it could be in the Caribbean Sea. 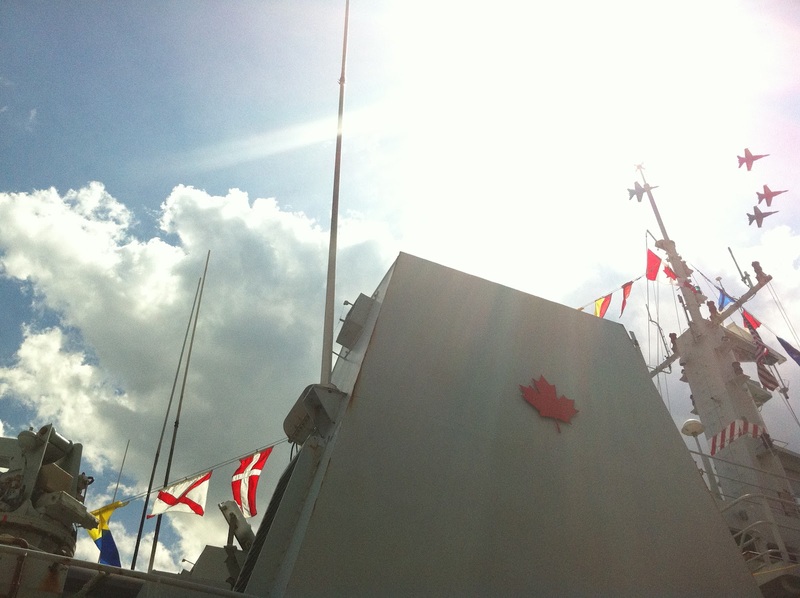 I mentioned to our guide that it was very nice that a Canadian warship could visit a celebration of a war in which the US tried to conquer Canada - she was very diplomatic noting that it was a less then flattering time for everyone and it was a long time ago. What if the US Had Really Won? But this got me thinking about alternative history - what would have happened if the United States had somehow prevailed 200 years ago and added Canada to its domains? Analyzing that possibility shows that the ambiguous outcome of the War of 1812 was in fact good for the United States. While it gave the British a bloody nose and established that the US needed to be treated with respect - failing to take control of Canada was actually a blessing. The United States conquered the West on a relative shoestring, so that until World War 2 the nation got by with only a modest military establishment. However, the sheer physical geography of Canada would have required a far greater military, which would have diverted resources from other needs. The human geography was even more hazardous. One of the reasons Andrew Jackson exacted such harsh policies on the native Americans was that he was worried that they would ally with foreign powers against the United States. This may not have been a realistic concern, but If Canada were part of the United States, it would have been. The US would have been governing substantial, hostile, European descended populations. Not just the Québécois, but also the Anglo population, a substantial portion of which had fled the early United States out of loyalty to the crown. This population would have had access to technology, intelligence, and contacts in Europe. It could then have allied with Native Americans throughout North America and helped equip and train them. This population would have enjoyed some important strategic advantages moving about the continent. In his Fields of Battle: The Wars for North America, Keegan notes that the French enjoyed an advantageous position in the French and Indian Wars. French scouts had reached far across the continent, while the British forces had difficulty breaking out of the Eastern seaboard due to the Appalachians. Sheer numbers prevailed in that conflict (there were over 2 million British colonists against about 50,000 French colonists.) But post-1812, with foreign support and the unhappy Canadians might have more effectively reached out to native Americans throughout the continent and done a far more effective job harrying the United States. Further, for much of the 19th century, the British Navy effectively defended the United States coast. If the US conquered Canada, the British would have been hostile rather then friendly/ambivalent and may have continued to support unhappy populations under US control. Finally, they might have encouraged Russian encroachment in the far northwest and along the Pacific Coast as well as Spanish/Mexican encroachment in the south and west. It is possible the United States could have managed these challenges, but at what cost. Would the US have had the resources left over to build the railroads and canals that fostered American economic expansion? How would large, disgruntled populations in the north have changed the confrontation over slavery and state’s rights? These questions, thankfully, are moot. Besides the geostrategic benefits of NOT conquering Canada, the Canadian victory gave that nation the courage to take its own path and become a capable and important state that has made itsown substantial contributions to the international community and humanity. Although the US and Canada squabble, their relations are a model for international comity and the thousands of miles of unguarded border are a sign of hope that in the right circumstances peace is possible. The United States is a better country because of its northern neighbor and in that way; the war of 1812 was a win-win. And thus, we can celebrate the war of 1812 jointly. Today is the 68th anniversary off D-Day, the Normandy Landings. 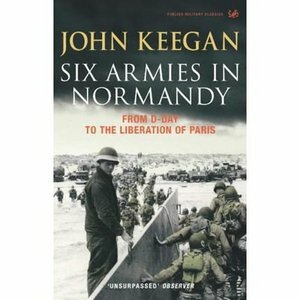 Some time ago I listened to British military historian John Keegan’s masterful Six Armies at Normandy. Keegan had been a boy during the war and was relocated from London to rural East Anglia. Although he followed events carefully and with great interest the war only touched his life peripherally – until the Americans arrived. And this was only the advance engineering team, constructing temporary quarters. American soldiers flooded the countryside and then, quite suddenly they were gone. The next day Keegan remembers waking to the sound of an enormous buzzing. He looked up and the sky was full of airplanes. It was June 6, 1944. In his book, Keegan writes a chapter on the six armies that participated in the Normandy campaign: the Americans, the British, the Canadians, the Poles, the French, and the Germans. One of his great strengths is shuttling easily between the grand strategic and the small-scale tactical. He does this particularly well describing the Americans. Having discussed the enormous resources of the United States and the strategic vision of Eisenhower in masterminding the operation, he then focuses on the American parachutists who landed the night before the main landing. They were successful beyond anyone’s expectations in sowing confusion in the German rear. On paper the allies had vast resources, but battles are often truly decided by small units, frightened and far from home, with little to rely upon but their own courage and ingenuity. Here the American parachutists shone, had they been unsuccessful it is not impossible to imagine the invasion itself would have been a bust. The Canadians also sent a major contingent to the D-Daylandings, but Canada had inadvertently made a major, albeit bloody,contribution to D-Day almost two years earlier. Churchill had developed an ill-conceived plan to seize the port of Dieppe. The primarily Canadian forces pushed directly into fortified German positions and took very heavily casualties. The read was a complete disaster – and yet – it taught the allies valuable lessons about how to conduct amphibious assaults, while persuading the Germans that the allies would not attempt such an operation again. Keegan writes respectfully about the Germans, who were primarily Wehrmacht and fought honorably (with a few exceptions.) This, like the brave Confederate soldiers and their brilliant general of the American Civil War, is yet another iteration of that terrible tragedy – men fighting well for a terrible cause. Keegan has a particular fondness for the Polish contingent. Having been defeated twice by the Germans – first in their homeland and then fighting alongside the French in 1940, the remnants of the Polish Army trained hard to become a modern effective fighting force. They cheered when they learned they were heading into battle, wanting to avenge their nation’s honor. They got their wish. In August, with the German 7th Army bottled up,the Polish division was the cork. The Germans attempted their break out and through a night of desperate, ceaseless fighting, the Poles held their position. The painful part is that even in their most desperate hours, the Polish division sought news from home. The Polish resistance had launched a massive uprising against the Germans, hoping for aid from the approaching Red Army. But the Red Army paused, allowing the Germans to demolish the Polish forces. Their situation was desperate. The cities sewers were their lines of communication and men ran into downed aircraft engulfed in flames to retrieve ammunition. Across France and the Benelux countries is a swath of towns liberated by the Poles. But they would have to wait another forty-five years for freedom to come to their own country. Far more men were engaged on the bloody eastern front, where enormous armies of men and machines faced off in massive battle after battle. But Keegan makes a compelling case that the victory the allies won on D-Day was perhaps the greatest of the war and one of the greatest military achievements of all time. It was the wealth of France the kept the Nazi war machine running. The granaries, mines, factories, and people of France all provided the critical supplies needed by the German forces. When these were effectively moved from one side of the ledger to the other, the Reich could not sustain its war. Large numbers of young Frenchmen were in hiding, to avoid impressment or work that would support the Nazis. As France was liberated these men hastily formed a French Army, rejuvenating the allied drive just as the British and Canadian levees were tapped out. All of this made fascinating reading, but I thrilled just a bit when, during Keegan’s chapter on the British Army on D-Day, he mentioned the Scottish Division. A Scottish Division was bound to include my favorite Scottish regiment, the Argyll and Sutherland Highlanders. How does a Jewish kid from Baltimore come to have a favorite Scottish regiment (is he a dork)? And if anyone is going to have a favorite Scottish regiment, shouldn’t it be the Black Watch?